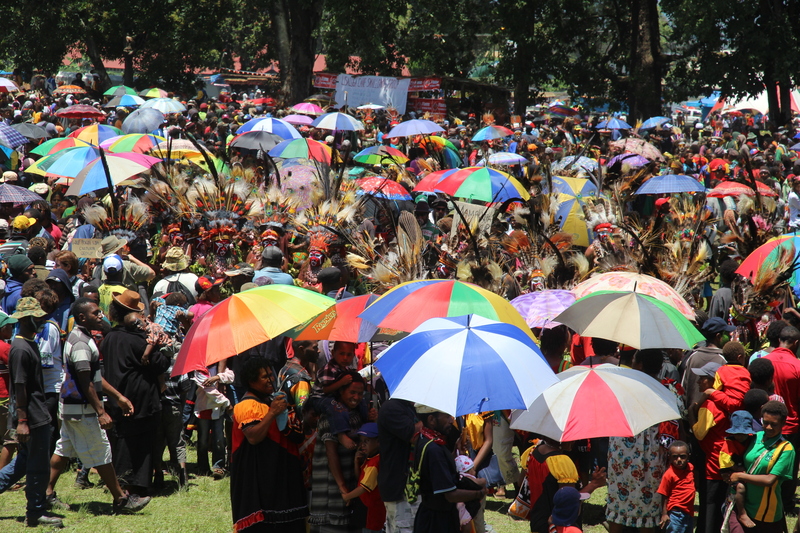 How big is the Goroka Show? Check out the crowds and throw in a little tear gas | Where to next? And who expected the gorilla? 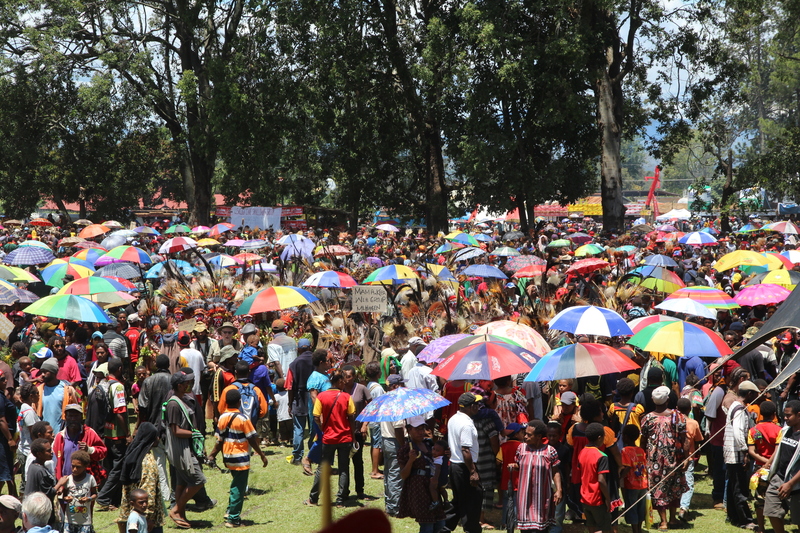 I’ve already mentioned that more than 130 tribes turned up for the Goroka Show in Papua New Guinea, but that number doesn’t even begin to convey the sheer hugeness of the event. So let’s have a stab at the maths—actually arithmetic! But keep in mind that some of the numbers are estimates. I know there were at least 130 tribes there with, say, on average, 20 people in each group. Tribes come from all around and bring family and friends with them. so I reckon there were at least another 20 hangers-on per group. If I’m right, that takes us up to at least 5200 people. 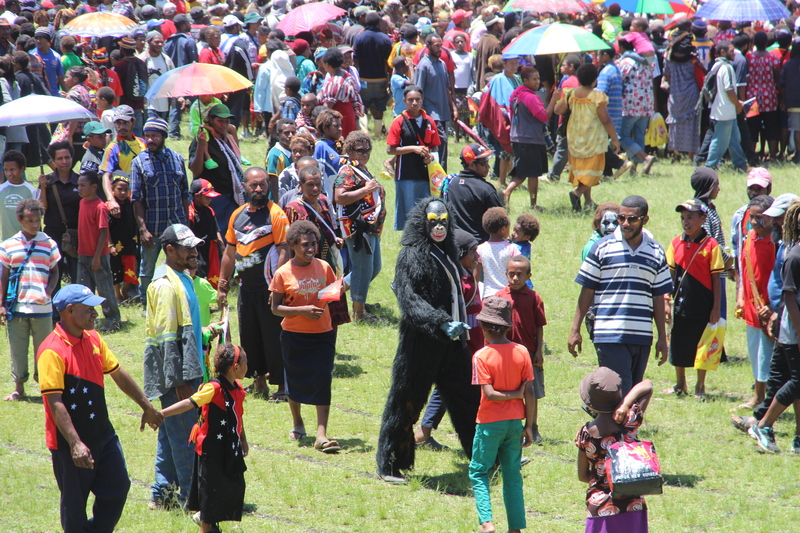 Then there were the VIP guests (about 400 of us who paid extra to get in earlier on both mornings) and then large numbers of visitors from Goroka and surrounds who were admitted after 12 noon both days. Goroka has almost 20,000 residents and the district has more than 70,000, so there was no shortage of people clamouring to get in. I’m guessing there were easily 10,000 people in the showgrounds both afternoons (after the entrance was opened to the public). Luckily the showgrounds can hold such a crowd. I reckon the area is larger than five or six football fields. I guess I’ll have to go back next year and pace it out. I love sharing some crowd shots and should mention a bit about the grand finale. Non-VIP visitors can get in for free after about 4pm on the last/second day of the show. From what we were told, the crowd outside on that last day got a bit too restless a little to early than the time for free entry. They even started charging the gate. Fast forward to when the tear gas was discharged just outside the showgrounds. It settled the crowd right down. Unfortunately, that was about the same time Poor John and I were heading straight for the entrance/exit gate, and the gas was blowing at us. I never knew how bad tear gas would affect my eyes. Yoew! Thinking back, I have to say that in spite of having lived through university in the 1960s and been an active protester in my own right, I’d never been tear-gassed until this year’s Goroka Show. We later encountered the Chief of Police, who said he told all his staff not to let off tear gas under any circumstances, but they said the crowd got so unruly, they couldn’t resist. So now I know about tear gas. Hope I never learn more. ouch. Great way to finish off a great show. It will make a neat final section in your book! After all the hoopla, the tear gas did seem the right finishing touch. Grandkids?! I wish! My own children are showing no signs of going forth and multiplying. Luckily two of our many long-term exchange students have presented me with three host grandsons. I saw plenty of tear gas when I was there, but luckily it didn’t get into my eyes. Goroka is a very, very unruly place during the show. It seems it hasn’t changed in 20 years, except maybe the security for tourists is even tighter. I guess tear gas must be an annual occurrence, just like the show. And yes, security was very, very tight. Well, I’ve stopped talking for the moment because I’m laughing so hard. Let’s check out Goroka town—without the tear gas | Where to next?